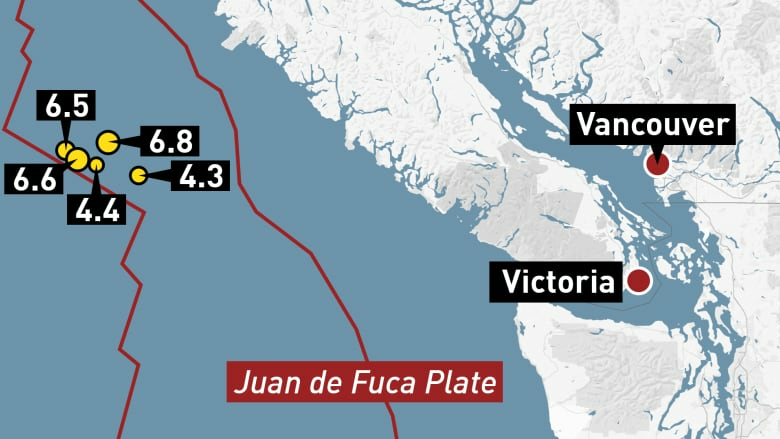 A series of three large earthquakes struck off the coast of British Columbia late Sunday, followed by aftershocks early Monday morning. CBC meteorologist and seismologist Johanna Wagstaffe said the earthquakes are a reminder that B.C. is in a "complicated" tectonic setting. Looking forward to more info tmrw but preliminary assessment this <a href="https://twitter.com/hashtag/earthquake?src=hash&amp;ref_src=twsrc%5Etfw">#earthquake</a> not in our subduction zone (too shallow for one) &amp; of strike-slip orientation (horizontal movement which is why no tsunami threat). We live in a complicated tectonic setting! "If any one of these quakes had hit closer to land, there would have been devastating consequences," said Wagstaffe about the Sunday-Monday quakes. "Three large ones in a row does seem unusual, and I'm sure scientists will be learning as much as they can over the next couple of days about the change in stresses just off our coast." There were no immediate tsunami warnings following the earthquakes. Earthquakes Canada also reported a magnitude 4.4 aftershock from the first quake before midnight, and three below magnitude 5.0 early Monday.